Have you ever lost a bid on eBay because someone else put a higher bid at the last seconds? Placing a bid just before the auction ends, also known as "sniping", is a strategy a lot of eBay bidders use to win auctions. 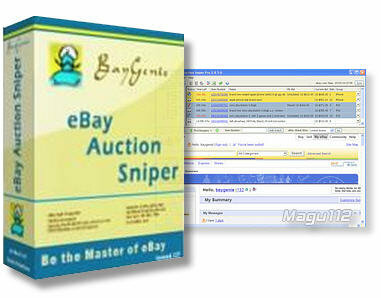 BayGenie will do the "sniping" for you!BayGenie automatically snipes eBay bids. It is a Windows tool that automates the process of placing bids on an eBay item at the closing time of the auction.With its seamless eBay integration, you can login to eBay and search for items using its integrated internet browser.Once you've found an item that you are interested, you can add it to your watch list and setup how long before the end of the auction you want BayGenie to place your bid. Then all you have to do is sit back and relax, or do whatever you want. BayGenie will automatically place the bid for you, even if it's 3am in the morning.BayGenie tracks eBay auctions. BayGenie also contains an auction tracking system that tracks all the items that you are watching, bidding, won or lost.BayGenie shows important information for each item, such as the current highest bidding amount, ending time, etc. It also supports multiple users so that different eBay users can use the same BayGenie without affecting each other.